Parsons: Disliking "Weapons" and "Bad Colours," he gives it a "C", 55/100. Michael5000: I like the tricolor-with-sidebar look, but the national symbol on the inside top, although it's just a single color, is hella fussy. Your Omani Betsy Ross is going to be spending a lot of time with the applique, I'll tell you what. Probably what she'll want to do instead is get one of the high-end consumer sewing machines where you can link to a computer graphics program, and just stitch that sucker in. 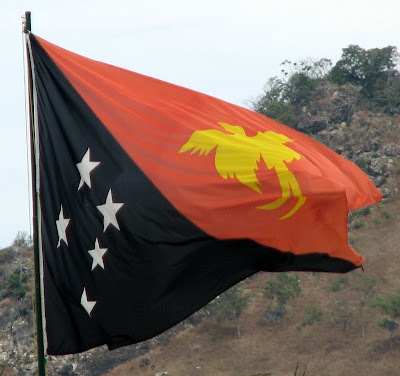 It would get the job done, but it doesn't feel in the proper flag spirit somehow. Parsons: "Best use of the star and crescent. Unfortunately, it depicts something astronomically impossible, namely the eclipse of the moon by a star. 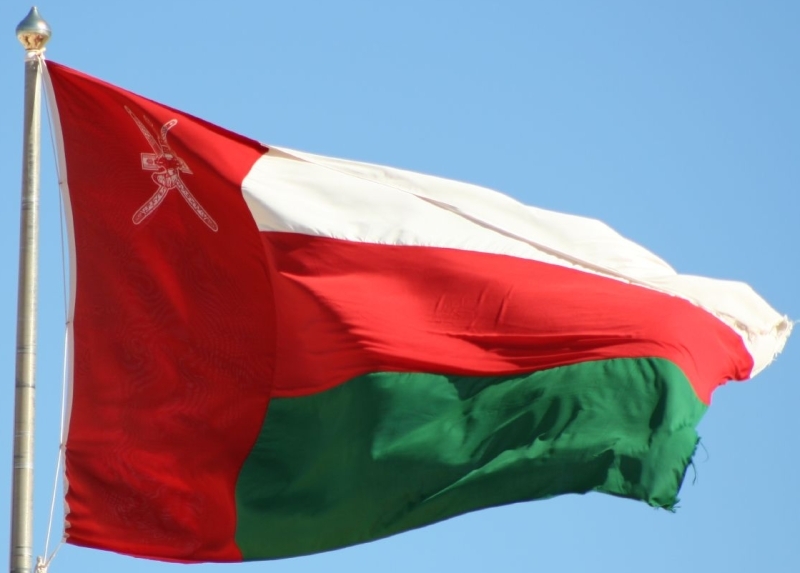 But perhaps it's not a star but a nuclear satellite-weapon aimed at India?" "Good Colours" for an "A", 88/100. Michael5000: It is, as Parsons says, a star and a crescent. The crescent is of course one of your major Islamic symbols, among Muslims willing to recognize religious symbols, and it isn't intended to represent the moon; the geometry wouldn't be right, even just within the crescent itself. So the astronomically-impossible business is off-base, or more likely just Parsons playing for laughs. 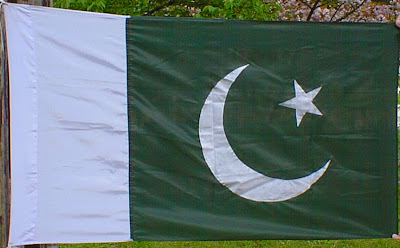 I like Pakistan's flag! It's got two color simplicity, and even though the colors and symbols are used by other countries the inside white sidebar really sets it off and makes it instantly recognizable. Win! Parsons: With an accusation of "Plagiarism," Parsons gives it a "C+," for 60/100. 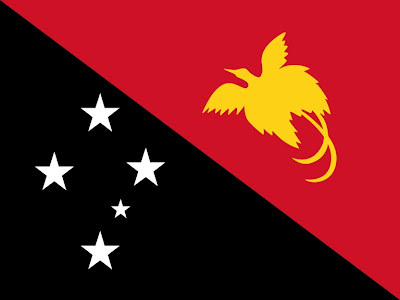 Michael5000: Yeah, yeah, "plagiarism," because having a circle on your flag is such a crazy, out-there concept, and Japan and Bangladesh completely wore out the concept. Or maybe the problem is that the color scheme is derivative of Sweden's? Whatever. It's a nice, simple flag, actually one of the most recognizable of the new-generation island flags. 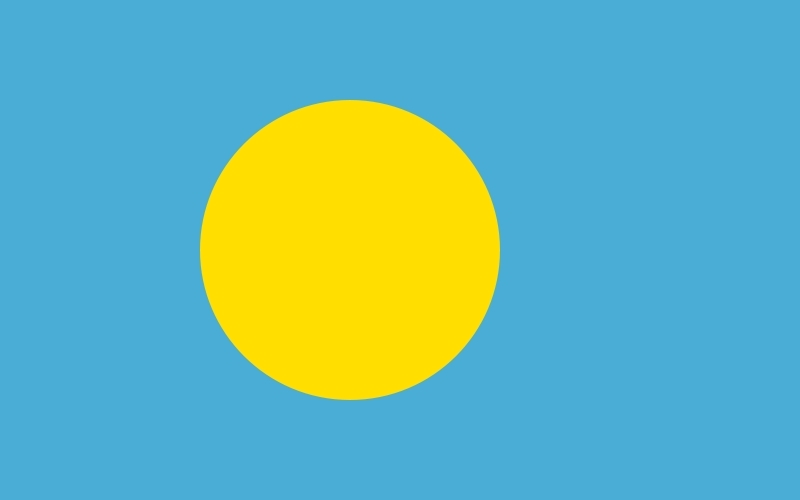 Once you get it in your head that a country called Palau exists -- that's the tricky part -- its flag stays with you like a sun in the tropical sky. I like the slight inward offset of the circle. Parsons: It's "Eyewatering," and it gets a "B", 70/100. Parsons: He doesn't like the "Graven Images," and gives it a "B-", 65/100. Michael5000: Well! 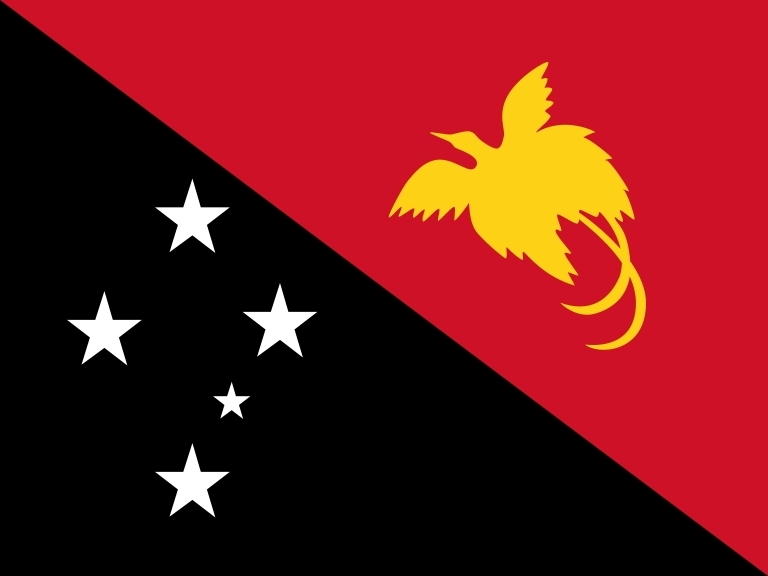 New Guinea's flag is right there at the front of the class in terms of distinctiveness. The diagonal is a bit jarring, though, and each half has some fairly fussy elements to it. Since all the graphic elements are solid color and at a fairly large scale, though, I'm probably less worried about the fussiness than Parsons is. 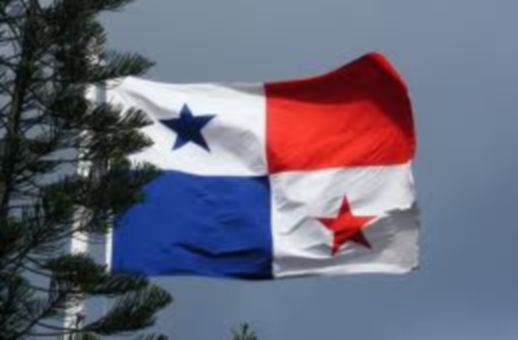 As busy as this flag looks as first blush, it only uses four colors. Hmm, I wonder how it looks on the pole?